The heart of the matter which caused the Indo-Pak wars in 1947-48 and in 1965 was Kashmir. On 26 October 1947, V. P. Menon, advisor to the new Governor General of India, placed before Mountbatten, a paper purported to be the instrument of accession signed by a vacillating but now frightened Hari Singh, the last ruler of the State of Jammu and Kashmir. This enabled the Dominion of India to employ its military power to help an ‘endangered state’ to preserve its integrity. The very next day, on 27 October 1947, Indian Air Force transport aircraft carrying Indian troops landed at Srinagar airport beginning the military occupation of Kashmir which lasts till today. Pakistan barely two and a half months old tasted the first Indian aggression. resist it. Having quickly captured the Valley of Srinagar and pushed out the ill-equipped freedom fighters from all the heights which overlook the Valley, the Indian forces began to expand in all directions to annex the whole of Kashmir. It was not until May 1948 that the first few regular units of the Pakistan Army could reach Kashmir for the support of the hard pressed freedom fighters. Indian advance was slowed down and eventually brought to a halt but not before a considerable portion of Jammu and Kashmir territory had been lost. Cessation of fighting came about on January 1, 1949 and the positions held by opposing forces became the Cease Fire Line invigilated by UN Military Observers Group. The Line of Control dividing Kashmir today is more or less the same Cease Fire Line. To the world in general, India repeatedly announced its pledge to hold plebiscite thereby allowing the 77% Muslims of Kashmir to decide their own future. But at home the Indian government consolidated its military hold by systematically removing all impediments that made the State of Jammu and Kashmir an entity separate from Indian Dominion. Thanks to her duality combined with vigorous diplomatic labours by early 1964 the world had grown sufficiently accustomed to the ground reality in the north-western part of the Subcontinent to look on it as a mere spectator. Ironically a military dictator of Pakistan tried in vain to resolve the dispute through negotiations with a democratically elected government of India which was inclined towards belligerency. The India-Pakistan Talks which began in 1962 ended inconclusively. To add injury to insult, when Pakistan vociferously protested in a meeting of the Security Council against India’s blatant amalgamation of the disputed State, the Indian representative in the UN announced arrogantly, that Kashmir had become an integral part of India on 27 October 1947 when the Maharajah of Kashmir had signed the instrument of accession and that, “You cannot make more complete what was already complete.”3 This meant that henceforth India had no intentions of holding plebiscite or of negotiating the dispute over Kashmir. The Indian government had calculated that in not too distant a future her five years re-armament programme started after the disastrous 1962 border war against China would clearly tilt the military balance in her favour so that even if the Kashmir problem lingered, India would have overwhelmingly military might to back her political arguments. Disturbance in Indian Held Kashmir was the result of Indian intransigence combined with harsh rule following the theft of the Holy Relic from the shrine at Hazaratbal in Srinagar. The Indian Army went on full alert in July 1965 when a Kashmiri shepherd of Gulmerg reported presence of ‘strangers’ (actually Kashmiri freedom fighters) in the neigbouring hill meadows (locally called margs) where he was grazing his flock. A widespread crackdown by the Indian regular forces in Kashmir valley could not completely quell the insurrection. During the last week of August 1965, the Indian Army undertook three major attacks across the Cease Fire Line, viz, one in Tithwal area against Pir Sahaba and two attacks, one each from Uri and Punch aimed at eliminating the Bedori Bulge. All Indian attacks were partially successful; in Tithwal area, Pir Sahaba was captured by 25 August while in Bedori area the Indians occupied Haji Pir Pass on 28 August. Pakistan responded to the Indian aggression across the Cease Fire Line on 1 September with a powerful thrust consisting of infantry and armour supported by artillery in the area of Chhamb aimed at Akhnur. The Indians were completely surprised by the size and direction of the Pakistani riposte. The immediate Indian reaction appeared in the form of six Vampires of IAF which arrived over the battlefield of Chhamb late in the afternoon that day. Despite heavy odds, two F-86 fighters of PAF took up the challenge and in the ensuing aerial combat shot down four enemy aircraft in quick succession; the remaining two Vampires survived by vanishing over the pale horizon. In New Delhi on 2 September the Indian Prime Mister ordered a reluctant Indian Army Chief to attack Pakistan itself in order to thwart the menacing operation which was likely to amputate Indian Held Kashmir altogether. The Indian forces took four days to move to the West Pakistan border and launch the famous attack on 6 September 1965. By 1965 the Indian Army had expanded considerably and was well on its way to modernization. The land forces were grouped into four commands, Western, Eastern, Central and Southern. Of these, the Western Command was responsible for West Pakistan while the Eastern Command was responsible for NEFA and East Pakistan. The Indian Army comprised five corps of which three (I Corps, XI Corps and XV Corps) were committed against West Pakistan. The strength of infantry formations had nearly been doubled from ten divisions to twenty divisions with the raising of nine new mountain divisions as part of the Indian five years re-armament programme started immediately after the1962 debacle. Bulk of the Indian Army grouped under the Western Command was employed against West Pakistan which is where all the major fighting took place. There was virtually no military action in East Pakistan. The forces arrayed against West Pakistan comprised the Indian armoured division and one independent armoured brigade as well as thirteen out of nineteen infantry and mountain divisions and six out of eight independent infantry brigades. To contest this massive Indian juggernaut Pakistan had only one and half armoured division, six infantry divisions and two independent infantry brigades; there was only one infantry division to defend the whole of East Pakistan against the India Eastern Command. Indian 15 Division had barely recovered from its clumsy start when a bold counter-attack by Pakistan’s 10 Division on 8 September once again sent the Indian troops reeling back toward the border. Withdrawing in alarm and confusion Major General Niranjan, GOC 15 Indian Division abandoned his jeep, with his flag and star-plates on full display, and preferred to retreat on foot! After a day or two however, XI Corps again regained its mental balance and the enemy was able to rally and resume the attack towards the BRBL Canal but now only on two axes Wagah–Atari and Barki–Hudiara; the situation on the third axis, i.e., Kasur–Khem Karan has been covered separately below. On the Barki–Hudiara axis Indian 7 Division was able to close up with the Canal only after the fall of Major Aziz Bhatti Shaheed, NH, and with him the fall of Barki village on 10 September. Thereafter the enemy remained contented with ransacking and looting villages lying abandoned between the border and the BRBL Canal. On the Wagah–Atari axis, Indian 15 Division was re-enforced by a para brigade and the enemy troops eventually reached the Canal on the GT Road painstakingly by capturing the village of Dograi only a day before the Cease Fire. Withdrawing in alarm and confusion Major General Niranjan, GOC 15 Indian Division abandoned his jeep, with his flag and star-plates on full display, and preferred to retreat on foot! Of these, only 4 GRENADIERS and 1/9 GORKHA RIFLES are intact. I am told by the GOC that the CO of 9 JAK RIFLES left his position, without orders, on the Night of 6th/7th Sep taking a company of infantry with him. 7 GRENADIERS are only about two companies strong. 18 RAJPUTANA RIFLES has about 10 per cent desertions and the GOC thinks that this unit is cracking up. I am further given to understand by the GOC that desertions are restricted to infantry units only and no other arm or service in the Division is affected. Because of the situation not a single task given to 4 Mountain Division in the current operations has been carried out. No bridge on the ICHHOGIL (BRBL) Canal in 4 Mountain Division Sector has been blown up. The GOC had to readjust the position of 7th Sep. When I visited him today he was arranging the preparation of a defended sector in the ASAL UTTAR Area. (a) That 4 Mountain Division be immediately replaced by some other formation for carrying out the role given to them. (b) Except for 4 GRENADIERS and 1/9 GORKHA RIFLES the four infantry units of 4 Mountain Division as given in Para 4 above should be disbanded. I request that you pay a visit to this formation at your earliest convenience to see at first hand its state of morale and the competence of its commander. It was privilege and an honour to have you here on the epoch making day – 6th Sep 1965. The Indian 1 Armoured Division advanced with two tank regiment groups and made good progress until they ran into ‘Men Of Steel’ belonging to 25 Cavalry at Phillaurah where the advancing Indian armour units were effectively checked. crisis. Pakistan had launched its armoured division against the very formation he had just visited and stabilized. ‘In the midst of this grim crisis on 10 September, Army Chief Chaudhuri asked Harbaksh Singh whether our forward positions should not be readjusted and established behind the Beas as the enemy armoured division might breakthrough.’ 7 Inexplicably however, in the evening Pakistani tanks were withdrawn for night leaguer, relinquishing all the gains of that day. The offensive was resumed on 10 September only to stall on account of disorientation and lack of sufficient information about the enemy in front. By 12 September the GHQ felt compelled to transfer 1 Armoured Division to Sialkot where the situation was deemed desperate. In the Sialkot Sector, Indian I Corps much like its neigbouring XI Corps, attacked on a broad front keeping no reserves for exploiting deep. The Indian attack on Sialkot front began on night 7/8 September, i.e., two days after their attacks in the Lahore Sector. This was due to longer time taken by Indian I Corps for it movement and assembly rather than any finesse or attempt at achieving strategic surprise. 26 Indian Division (belonging to I Indian Corps) attacked on two axes, Jammu–Sialkot and Bajragarhi–Sialkot. After some early success 26 Division’s steam ran out and its attack ground to halt only a short distance from its starting point on the Working Boundary near Suchetgarh. Here it remained during the remaining days of the war. A bold counter-attack by Pakistan’s 15 Division launched on 9 September caused some disarray among Indian troops. However, 26 Division launched a fresh attack but not until 18 – 21 September when it was reinforced by a brigade size force. Launched north of the Suchetgarh – Sialkot axis, the fresh enemy attack met initial success only to peter out eventually. Defence of Sargodha was vital for PAF to remain an effective force. The Shaheens rose to meet the Indian aerial onslaught and shot down eleven enemy aircraft for the loss of only one; there was absolutely no damage to the Sargodha airfield. Running silent, running deep and operating alone, the submarine GHAZI did not lag behind in action. Having returned to port on 14 September for repair of an ECM defect, GHAZI sailed out again on 16 September with the task to patrol off the Kathiawar coast. On night 22/23 September it encountered enemy activity and fired its torpedoes badly damaging INS BRAHMAPUTRA. Pakistan Navy was a tiny force compared to its Indian counterpart. Besides an aircraft carrier with thirty combat planes, the Indian Navy comprised two cruisers, three destroyers and sixteen frigates. Against this armada, the Pakistan Navy had only one cruiser, five destroyers, two frigates, four gunboats and one submarine. A flotilla of surface ships comprising destroyers and frigates was deployed to patrol the Arabian Sea off Karachi to keep the enemy at bay while the lone submarine GHAZI positioned itself off Bombay bottling up all the Indian naval vessels anchored in that harbour. This afforded an opportunity to the Pakistan Navy to launch an offensive strike against Dwarka without any fear of interference from the enemy navy. Accordingly at 6 p.m. in the evening on 7 September, one cruiser accompanied by five destroyers and a frigate set course for Dwarka with the Indian naval radar station located there as the target. The Pakistani task force arrived at its designated position by midnight and shortly thereafter opened fire. Although effectiveness of this firing activity could not be ascertained, it definitely raised the morale of the Pakistani sailors who though few in number had given a befitting reply to the India aggression across the international borders. The leadership and sailors of Pakistan Navy relied on imaginative planning and extra-ordinary boldness in operational execution sustained by high level of motivation. Their courage adequately compensated the enemy’s maritime numerical and qualitative superiority. The outcome of hostilities at sea was inversely proportionate – moral victory of the small Pakistan Navy over the much bigger Indian Navy. IAF enjoyed an overall superiority in number of aircraft as well as in air support infrastructure (bases and radars etc). Against approximately IAF 30 squadrons the PAF had only about twelve squadrons. However, what PAF lacked in quantity, the Shaheens made up in quality. A sizeable number of PAF’s front line aircraft were armed with air-to-air missiles which IAF did not have. Besides this technological edge, the PAF displayed remarkable level of professional training and a very high degree of personal motivation, courage and valour at all levels throughout the short but intense war. The skirmish in Rann of Kutch followed by the insurrection in Kashmir had obliged both air forces to maintain a high level of alert from April through August 1965. As mentioned above, the IAF lost four out of six Vampire aircraft on 1 September in their very first aerial combat with the PAF. This victory not only boosted PAF’s morale tremendously but also transformed the total air power situation in Pakistan’s favour. On 5 September, IAF suffered another blow to its prestige when a Gnat aircraft was forced by PAF fighters to land at Pasrur airfield. Thus by the time the Indian Army attacked across the international border, IAF’s morale was already considerably diminished. The PAF followed up its early successes with pre-emptive air strikes on 6 September against Indian air bases at Pathankot and Kalaikunda destroying 24 enemy aircraft and damaging seven. Nevertheless the enemy air force launched a series of air strikes on 7 September at the pivotal air base of Sargodha. Defence of Sargodha was vital for PAF to remain an effective force. The Shaheens rose to meet the Indian aerial onslaught and shot down eleven enemy aircraft for the loss of only one; there was absolutely no damage to the Sargodha airfield. Thereafter IAF gave up daytime raids altogether and resorted to night sorties without achieving any meaningful result. A tiny PAF had attained a decisive victory over a much larger adversary long before imposition of Cease Fire on 23 September. IAF enjoyed an overall superiority in number of aircraft as well as in air support infrastructure (bases and radars etc). Against approximately IAF 30 squadrons the PAF had only about twelve squadrons. However, what PAF lacked in quantity, the Shaheens made up in quality. panic. Incredible as it may seem both offensive corps (I and XI) attacked on such broad fronts as to be completely ineffectual; both these Indian corps committed all their forces at the very outset retaining nothing in reserve! XI Indian Corps employed all its three divisions on 6 September at the start of the offensive; all the three divisions in turn committed nearly all their brigades at different points. The only element of XI Corps not committed on 6 September was 2 Independent Armoured Brigade. Similarly, Indian I Corps operating in the Sialkot Sector also committed all its three divisions including 1 Armoured Division at six points starting from Jammu–Sialkot axis all the way to Degh Nadi; the fourth division (14 Division) could not be committed because it was not able to complete its movement in time. The result of such over-extended deployment was that the Indian Army was stretched along a wide frontage without being strong anywhere to achieve meaningful results. Essentially the Governments and the military on both sides were dissatisfied with the outcome of the 1965 War though the general public of both Countries claimed and continues to claim complete victory. Pakistani people’s claim to victory is absolutely justified; with much lesser population (one fifth of India’s), smaller armed forces (less than half of the Indian army and miniscule air force and navy) and fewer resources they had not only held the Indian giant at bay and frustrated his reprehensible designs but also caused him to panic on several occasions. What has India to boast about? That in a fit of nervous fright her ‘seasoned’ political leadership turned volte-face on its pledge of plebiscite and instead decided to wage war only to retain its military hold over Kashmir? That its armed forces though much bigger in size failed to achieve their objectives suffering disproportionate attrition in the bargain? Hardly anything much to boast about for the biggest democracy in the world. Ironically the war in 1965 was initiated by a civilian democratic government of India which ostentatiously avowed peace and the principles of Satya (truth) and Ahimsa (kindness) but was inwardly belligerent while a ‘military dictator’ in Pakistan who, far from being a war monger, had bent all his militaristic energies before 1965 to persuade India to the table. The crucial clause here is, ‘their adoption tried’. In other words we must nurture such friends whose reliability and sincerity in fulfillment of mutual obligation has been tried and tested over time. The Holy Qur’an makes it mandatory to fulfill all obligations of treaty or agreement regardless of creed. It is well known that it was for fulfillment of his treaty with the pagan tribe called Banū Khuza’ah, that the Holy Prophet(PBUH) marched on Mecca, his home town, and against pagan Quresh, his own tribe! As true Muslims our struggle must not be to seek past glory but only sincere fulfillment of our destiny as defined in the Holy Quran – establishment of justice, enjoining righteousness and thwarting transgression. Belief is one part of the faith – its practical fulfillment is the crucial component. But this is a subject which demands exclusive and comprehensive treatment. The writer is a former Corps Commander and DG ISI. 4 Mahmud Ahmed, Lieutenant General, Illusion of Victory, Lexicon Publishers Karachi, 2002, p. 9. 5 Harbakhsh Singh, Lieutenant General, WAR DESPATCHES Indo-Pak Conflict 1965, Lancer International B-3 Gulmohar Park, New Delhi, 1991, pp. 91-92. 7 B M Kaul, Lieutenant General, Confrontation with Pakistan, Vikas Publications, Delhi, India, 1971, page 38. 8 Mahmud Ahmed, op cit. p. 395. 9 Bhupinder Singh, Lieutenant Colonel (Retired), 1965 War – Role of Tanks in India-Pakistan War, BC Publishers, Pattiala, India. April 1982, p. 190. 10 Mahmud Ahmed, op cit, p. 482. 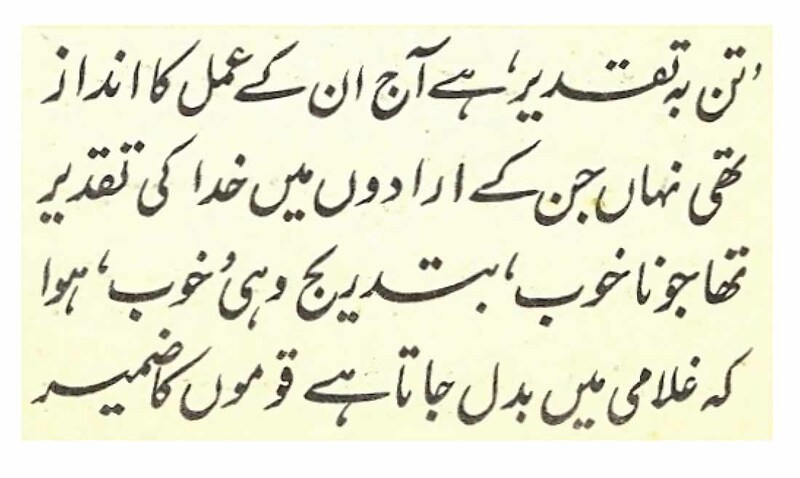 11 Mahmud Ahmed, op cit., p. 533. 12 Harbakhsh Singh, op cit, paras 130-131, p. 159. 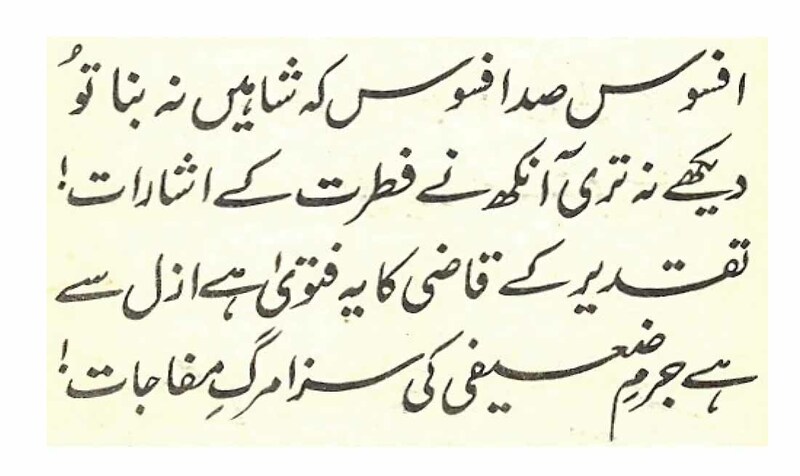 16 Kulyat-i-Iqbal – Tipu Sultan ki Wassiyat, Page 535. 17 Shakespeare, HAMLET, Act 1 Scene III, advice by Polonius to his son Laertes. July 1947 – 1 January 1949: Military occupation of Kashmir and war in Kashmir.